Apple has recently released version 7.1 of its mobile operation system iOS. As of now iOS 7.1 is only available for developers and not yet available for the normal user. iOS 7.1 brings lots of little UI tweaks and fixes a ton of bugs. We will first take a look at the UI tweaks, adjustments to the animations and newly added things. Several changes have been made to the Notification Center, if there are no notifications available the text that will appear now says “No Missed notifications” or “No Notifications” instead of showing a blank screen. 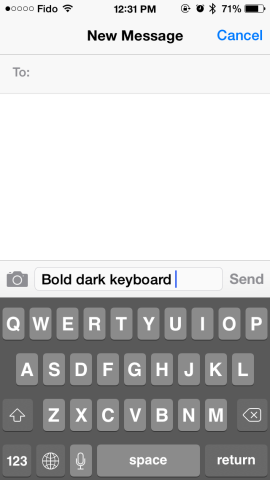 In iOS 7.1 several changes have been made regarding the Keyboard. You can now choose to use a darker keyboard and not be forced to use the default white keyboard, if you instead of a passcode use the keyboard to unlock your phone, you will also see some changes there in the color used for the keyboard. The lock in the control center now either opens or closes when you have Screen Lock enabled or disabled. A new feature has also been added to the Camera app in iOS 7.1 allowing “Auto HDR”. On the iPhone you can enable HDR which stands for High Dynamic Range Imaging which will take several photographs which it makes incredibly fast and combines the best part of each image to create “the perfect” photo. Another change made to the camera is that you can now upload all of your “burst photos” to your photostream or upload them to your iMac. There have also been some changes to the music app changing the way songs appear making it less “cluttered” and it has been made just a bit wider throughout. instead of saying ‘No Missed Notifications,’ it now just says ‘No Notifications’ when NC is cleared. Found any other tweaks or added features we haven’t mentioned, make sure to share them in a comment bellow! Animations are now even faster than in beta 1.
new label to show you where audio is coming from. New list view redesign/toggle in Calendar app. could you provide a little more information? if possible some screenshots? Thanks for letting us know! ‘HDR Auto’ feature for iOS 7.1 for my phone. Please verify this. Thx. AssistiveTouch bug didnt fix it? When on AssistiveTouch play game will feel lag after off and smooth game play!